» Tutorial » How To Make A Website Trustworthy? How To Make A Website Trustworthy? A trustworthy website is all it takes to either lure customers or bear the consequence of seeing them move away. There is no denying the fact that it is imperative to give the appropriate makeover to your website and make it as trustworthy as possible, if you want prospective customers to remain connected with your website. This is so because you cannot afford to scare away your customers through any website which is either difficult to operate or has an element of suspicion. In the current era of cut throat competition, there is no excuse for a poorly designed website. You need to design the best ever website in order to make sure that you attract maximum customers. Your website must look equally attractive and functional so that people can learn more about your product and become your permanent customers. This can be explained using a simple example-What would a customer prefer? An online restaurant that looks congested, creepy and smells foul or one which has an attractive logo, beautiful lights and smells great? Undeniably, the latter one. Nothing would piss off a customer greater than a piece of old outdated content. Make sure that the content written on the website right from the product type to the other aspects of the website are covered very clearly on the site and the information given is up to date. This information should be checked regularly and any updates must be added simultaneously. Also, make it a point to go through the old post on your website and blogs as well to make sure that there isn’t any outdated content on the website. If so, delete it and replace it with a fresh content. This is critical to ensuring a healthy website. Sometimes it might be the case that your website looks great for all customers but does not adhere to the needs of certain atypical customers. This should not be the case if you want your website to outshine all other websites. Try and create one which caters to the needs of all, from the most common customers to the most unconventional ones. To take a simple example, let us say that a plastic surgeon is looking at your website and is on the lookout for something related to his profession. Now if your website does not cater to his requirements then that person would withdraw from your website. Therefore, make sure that your website caters to the needs of all. Now one standard rule for selling products online is that you focus on the benefits of the products more in comparison to their features. People do not like complicated things. They would prefer a statement displaying an offer like “Full download of a 4 GB movie in 10 min” rather than a complicated stuff like “60 Megabyte connection over fibre optic network”. This implies that people prefer benefits more than features. So this is one smart pick for a trustworthy website. Make sure that the benefits are highlighted rather than the features. This aspect is one of the important keys to an alluring website. Now your sole purpose of designing a particular website is the customers. You need to keep that in mind before proceeding ahead with website building. After all, the products or the service which you will be designing would be consumed by the target audience at the end so make sure that you target your audience and keep it at the centre stage. 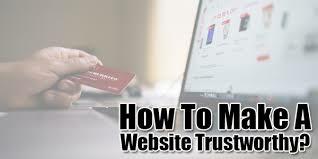 This would offer the benefit of attracting the customers towards your website thereby making it more trustworthy. Do you want to piss off your prospective customers even before they become the regular ones? Of course not so it is very important to take note of the fact that the website does not take much time to load. If it does then no customer would get attracted towards your website and it would take just a few seconds for them to click on some other competitive website. Reduce the buffering time of the website and see how good your website becomes. Now in this age of a technical revolution where each of us is utilizing that smart phone, the excuse of an unresponsive website simply cannot work. You need to make sure that the people visiting your website have a good user experience. Invest in your money and time in making the website responsive and see how customers get allured to your website easily. Social proofing is an important factor affecting the success of a particular website. Social proofing is the way of showing that yours is a trusted website and that other people use and trust it. This is very important in establishing trust for your website as it rests on the aspect of human behavior which says that people look at each other behavior and action and then proceed with their action accordingly. This can be illustrated by a simple example where people go for online booking of hotels in tourist places based on the reviews of others. There is nothing wrong in making use of artificial images but authentic images make a mark. Consider hiring a professional photographer to take pictures of your office, staff and products. This will ensure quality on your website and work well for every content, revealing authenticity throughout the website. This is one factor which people often ignore but can contribute a lot in building a great trust factor for the website. We all are aware of the fact that customers are driven by what others feel after using a particular product or service. Rather than telling about your website on your own, it makes more sense to go for the marketing option. You must go for marketing things that people say about you. A great way of establishing credibility among prospective customers is using testimonials and reviews. Keep this section of reviews and testimonials separate or rather highlight it so that customers do not find it difficult to trace them. Reviews and testimonials do leave a great impact but a video featuring your esteemed clients will be all the more powerful. Seeing real clients in front of your eyes adds to that trust factor. Try creating a powerful video. However, if your clients reside in distant places and reaching them is hard, then you can try adding a video of your staff demonstrating the uniqueness of your company and how it can serve you in a better way. You should be active online and the visitors on your website should feel that you are dedicated to your work and customers. Create a great impression on your customers by showing that you are committed to improving your business, product or service and want to build a strong customer relationship base. This can be done through a fresh, quality content including a date. You can even use a built-in blog, a Twitter feed or take advantage of any app. You need to answer all customer queries and comments if there are, on your website. Respond to each and every comment. If visitors notice that you are not replying to their messages or tweets then they will be under the impression they you do not care but if you reply promptly then they would realize that you care and are willing to work for them. Make sure that your website does not contain 404 errors and broken links as they detract from visitor’s user experience and ultimately affect your visitors negatively as they lose trust in your website. You can make use of plugins and install them for tracking 404 errors and broken links. These plugins include 404 page,404 to 301,Broken link checker, Broken link manager etc. You can further improvise by creating a custom 404 error page to help visitors get what they want and know something about your company. You should never post ads on a website that you sell other services or products from. This leaves a negative impression on the viewers and they think that you are not making enough money out of your business. It also shows that you are quite desperate to monetize your website. Keep away from doing this. Use it only to showcase your offerings. Title : How To Make A Website Trustworthy? 1 Response to "How To Make A Website Trustworthy?"